Drain and mix the two rice and grind to a smooth batter. Drain the dal and grind to a smooth batter. Mix both the batters, add salt and whip with hand thoroughly. Keep the batter in a large vessel, close tightly and rest the batter overnight or for about four to six hours at room temperature to ferment. Mix the batter well, add water and adjust to a pouring consistency. Heat a flat non-stick tawa. Pour a ladle full of batter and spread it as thin as possible. Sprinkle a little molagapodi over the dosa. 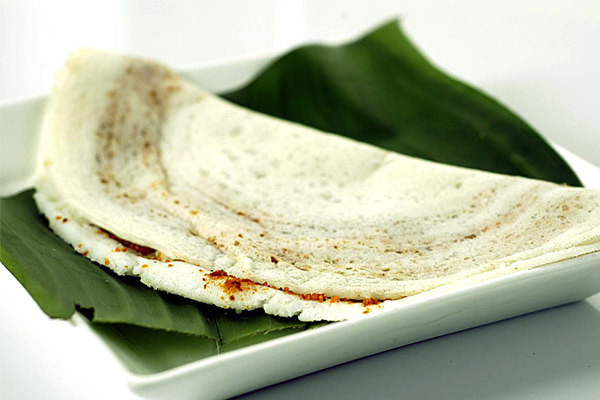 Sprinkle a little water over the dosa and also around it, cover with a banana leaf and then with a lid and cook till the underside is done. Gently fold into half and remove onto a plate. Serve immediately.